Mahogany Ridge at Bonita Bay is a small enclave of homes in Bonita Bay located near the bay and Spring Creek. Homes in Mahogany Ridge were built between the years of 1998-2001. The neighborhood is completely built out and there is only resale real estate available in Mahogany Ridge. Every home in Mahogany Ridge has it’s own private swimming pool or pool/spa combination. Home sizes range from approximately 2,800-4,300 square foot of living space and have a minimum of three bedrooms or larger plus a two car attached garage. The legal description of Mahogany Ridge is Bonita Bay Unit 43. 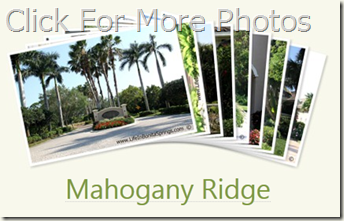 The community of Mahogany Ridge consists of one cul-de-sac street, Mahogany Pointe Ct. The street is constructed of hand set brick pavers which lends to the Mediterranean ambiance of the area. Spiral Columns, arched windows, wrought iron gates and crawling bougainvillea add charm and unique architectural details. Home owners in Mahogany Ridge are within bike riding distance or a short walk to Spring Creek Park one of three private park amenities within the gates of Bonita Bay. Homes in Bonita Bay which are similar to Mahogany Ridge homes include Coconut Isle, Augusta Creek at Bonita Bay and Mira Lago at Bonita Bay.